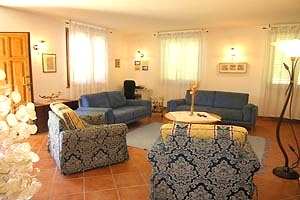 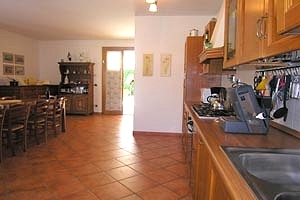 Holiday villa in the Upper Valdarno, near Loro Ciuffenna (Arezzo). 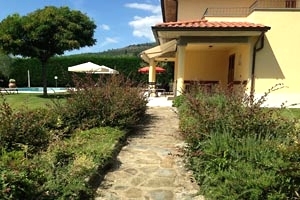 10/13 sleeping accommodations, swimming pool, barbecue, Internet connection, 3 garages, wide fenced garden. 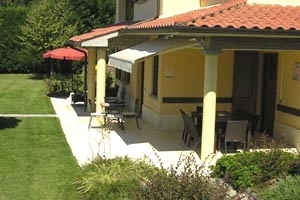 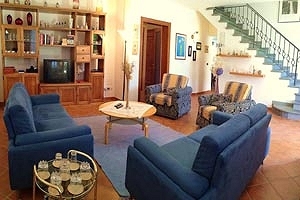 The villa (10+3 sleeping accommodations) stands on the side of the Pratomagno, just a few kilometres from Loro Ciuffenna, a small village of medieval origin in the Upper Valdarno. 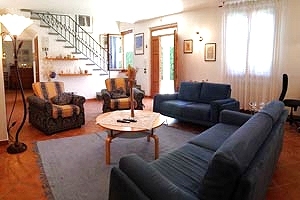 The estate is along the so-called road of the "Setteponti", which passes through various medieval villages and in the past was used by the Roman legions. 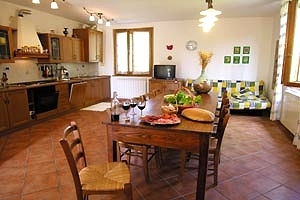 The villa is the ideal accommodation for those who love hiking or mountain biking at the discovery of ancient Romanesque parish churches. Florence, Arezzo, Pisa, Siena and other important Tuscan cities of art are easily reached both by car and by train, for wonderful one-day trips. 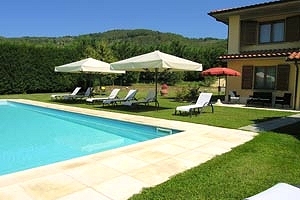 Immersed in the olive groves and vineyards that characterize the Tuscan countryside, the building is surrounded by a wide fenced garden (1,500 m²) furnished with outdoor furniture. 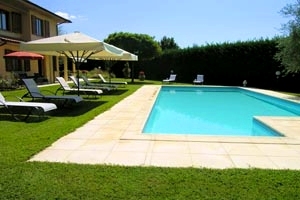 In the garden are the swimming pool (6x12 m; depth: 1.40 m) equipped with sunloungers and the barbecue equipment. 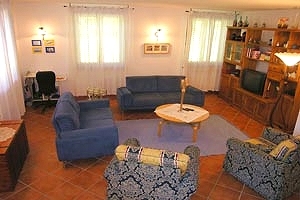 The two-storey building (5 double bedrooms + sofa bed and supplementary single bed in one of the bedrooms and 3 bathrooms) is provided with all comforts (satellite TV, DVD player, videocassette recorder, ADSL Internet connection, Play Station 2, dishwasher, washing machine, iron, electric oven and hair dryer). 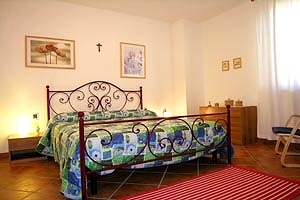 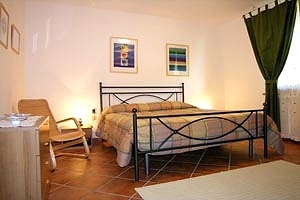 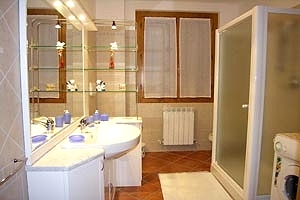 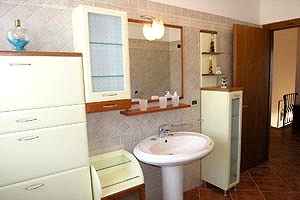 At guests` disposal: a cot bed and three garages. 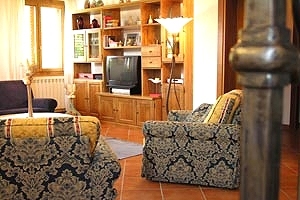 The ground floor composes of a large kitchen with dining area for up to 12 people, a living room with two armchairs and two sofas (one of which is a sofa bed), 1 bedroom with big double bed and 1 bathroom with shower. 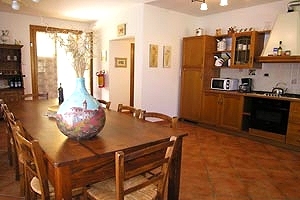 The kitchen opens onto the porch furnished with tables and chairs. 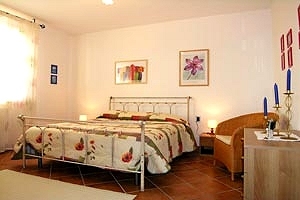 On the first floor are a hallway, 3 double bedrooms, 1 bedroom with a bunk bed with third pull-out bed, 1 bathroom with shower, 1 bathroom with bathtub and a panoramic balcony.